UCSC graduate student Peter Lippert and coworker Igor Villa of the University of Bern collect samples from an outcrop in Tibet (above). 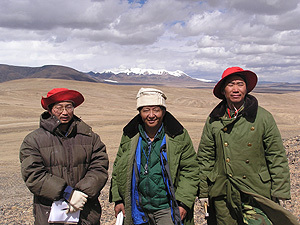 UCSC scientists joined Chinese geologists Yalin Li, Chengshan Wang, and Shun Liu (below, left to right) and others to conduct research in central Tibet. Photos courtesy of Xixi Zhao. The vast Tibetan Plateau--the world's highest and largest plateau, bordered by the world's highest mountains--has long challenged geologists trying to understand how and when the region rose to such spectacular heights. New evidence from an eight-year study by U.S. and Chinese researchers indicates that the plateau rose in stages, with uplift occurring first in the central plateau and later in regions to the north and south. "The middle part of the plateau was uplifted first at least 40 million years ago, while the Himalayan Range in the south and also the mountains to the north were uplifted significantly later," said Xixi Zhao, a research scientist at the University of California, Santa Cruz. 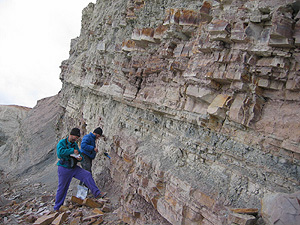 The team found marine fossils suggesting that the now lofty Himalayas remained below sea level at a time when the central plateau was already at or near its modern elevation, Zhao said. The average elevation of the plateau today is more than 4,500 meters (14,850 feet). The researchers published their findings in the Proceedings of the National Academy of Sciences (online the week of March 24 and later in a print edition). Zhao, who is affiliated with the Institute of Geophysics and Planetary Physics at UCSC, is the second author of the paper. First author Chengshan Wang of the China University of Geosciences in Beijing has been collaborating with Zhao and other UCSC researchers since 1996. Known as "the roof of the world," the Tibetan Plateau was created by the ongoing collision of tectonic plates as India plows northward into Asia. Coauthor Robert Coe, a professor of Earth and planetary sciences at UCSC, said ideas about how the uplift of the plateau occurred have been evolving since well before his first visit to Tibet in 1988. "People used to talk about the whole plateau coming up at once, but it has become clear that different parts of the plateau were elevated at different times," Coe said. "Our work shows that the central part of the plateau was uplifted first, and it seems to fit pretty well with other studies." The rise of the Tibetan Plateau led to dramatic changes in the climate, both regionally and globally. For climate researchers trying to understand major episodes of global climate change in Earth's past, the timing of the uplift is a crucial piece of information. "One of the traditional views of when Tibet became a high plateau is that it's a relatively recent phenomenon that happened in the last 15 million years," said coauthor Peter Lippert, a UCSC graduate student who has spent five field seasons studying the geology of the plateau. "The existence of a high plateau at least 40 million years ago could have important climatic implications." The team of U.S. and Chinese geologists based their findings on extensive field studies conducted mostly in a remote interior region of the Tibetan Plateau. They focused on an area called the Hoh Xil Basin in the north-central part of the plateau. The area's geologic history is recorded in layers of sedimentary rock 5,000 meters thick. Now a part of the high plateau, it was once a basin on the northern edge of the central plateau, Lippert said. "The structure of the basin and way the sediments were deposited show that it is the type of basin that forms at the base of large mountains. So we've shown that there was high topography to the south of the Hoh Xil Basin at least 40 million years ago," he said. Several lines of evidence support the team's conclusions. In addition to field studies, the researchers used a variety of laboratory techniques to analyze and date the rocks. Past changes in Earth's magnetic field, recorded in the magnetization of the rocks, provide one method of dating. Called magnetostratigraphy, this analysis was performed in Coe's laboratory at UCSC. Another dating technique used in the study, called apatite fission-track analysis, is based on the damage trails left in apatite crystals by the decay of radiogenic isotopes. The researchers also discovered volcanic rock in an area of the central plateau south of the Hoh Xil Basin. The flat bed of hardened lava lies on top of tilted and folded layers of sedimentary rocks; geochronology techniques dated it to 40 million years ago. "The presence of these flat-lying volcanic rocks tells us that the sedimentary rock was deformed prior to the volcanism, and it extends the age of volcanism in this part of Tibet from 15 million to 40 million years ago," Lippert said. In the Himalayas, the team found fossils of marine plankton called radiolarians that turned out to be 5 million years younger than any previously discovered marine fossils from that area. The discovery narrows the window of time during which the Himalayas could have been uplifted. When the central part of the Tibetan plateau was uplifted more than 40 million years ago, Mount Everest and the rest of the Himalayas were still part of a deep ocean basin, Zhao said. The Himalayan region is very complicated, however, and other groups are working to determine the timing of its uplift more precisely, said Lippert. "Our main contribution has been the data we gathered from the north-central part of the plateau, which has not been well studied," he said. Zhao noted that the U.S. researchers could not have gained access to this area without the support of their Chinese colleagues. This long-term collaboration has included exchanges of graduate students between UCSC and Chinese universities, as well as opportunities for UCSC undergraduates to conduct field research in Tibet. "It has been a very good research collaboration, with a strong educational component as well," Zhao said. In addition to Wang, Zhao, Lippert, and Coe, the coauthors of the paper include Zhifei Liu of Tongji University in Shanghai; Stephan Graham of Stanford University; Haisheng Yi, Lidong Zhu, and Shun Liu of Chengdu University of Technology in Chengdu; and Yalin Li of China University of Geosciences in Beijing. This research was supported in part by grants from the National Key Basic Research Program of China, the U.S. National Science Foundation, and the Institute of Geophysics and Planetary Physics at UCSC. Note to reporters: You may contact Zhao at (831) 459-4847 or xzhao@pmc.ucsc.edu; Lippert at plippert@es.ucsc.edu; and Coe at (831) 459-2393 or rcoe@earthsci.ucsc.edu.